A toy that will be fun for the whole family. Holey Moley! Mischevious moles popping out of their holes are making a mess of the landscape. Every time a plane flies by, more moles parachute out! Your mission: Hit the moles back down in their holes, and knock the planes and jumping moles out of the sky as fast as you can! Pesky diggers are popping up all over, but a good whack on the head should get rid of them. 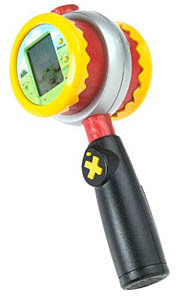 This electronic handheld version of the popular arcade game has players swinging the mallet and hitting moles for points. The mallet head has an LCD screen on one side and a plastic coating on the other-- offering minimum damage when smacked against most surfaces. The various sounds (hitting a mole, missing altogether, accidentally bopping a bunny) aren't too intrusive, but their volume cannot be controlled. The burrowers pop up often enough to keep players on their toes, but not so fast that they get easily frustrated. Keeping a firm grip on the handle while also trying to maneuver the button for mallet position can be tricky.